Italy’s quest for a worldwide moratorium on the death penalty will face such strong oppositionists as the U.S., but this step could lead to its success, Italy's foreign minister said. "I think there is a change in mood, of public opinion," Foreign Minister Massimo D'Alema said in an interview Friday, noting that 130 countries have now abolished the death penalty. "Over the years we have taken some great steps forward, which means it's possible. There are international pressures, a maturing of public opinion. Things are changing." D'Alema spoke following a meeting on the sidelines of the U.N. General Assembly during which representatives from 101 countries agreed to form a task force to pursue the moratorium and draft a General Assembly resolution. The resolution will need 97 votes in the 192-member U.N. General Assembly to pass. "This is a positive sign, it is not the solution," D'Alema cautioned, noting that powerful countries that apply the death penalty, including China, the United States and Singapore, are likely to lobby against it. "It is one thing to attend an event, it is another to vote for it because we can expect maybe, much lobbying against (the moratorium), and these are countries that have a great influence," D'Alema said. The meeting was hosted by Italy and Portugal, which holds the rotating European Union presidency. It included representatives from South Africa, Burundi, Senegal, Angola, Brazil, Mexico, the Philippines, the Ukraine and Russia. China sent an observer, D'Alema said. Human rights organizations including Amnesty International also attended the event, and East Timor President Jose Ramos-Horta, a Nobel Peace prize winner, was among the speakers. Italy began a diplomatic push against the death penalty after the Dec. 30 execution in Iraq of Saddam Hussein and has been lobbying for months to get support. Past lobbying by Italy for U.N. action to strike down the death penalty in 1994 and 1999 was unsuccessful, partly because of opposition from the United States, which has executed more than 40 people this year and about 1,100 people since the U.S. Supreme Court allowed capital punishment to resume in 1976. Earlier this week, Richard A. Grenell, spokesman for the U.S. Mission to the United Nations, declined to speculate how the United States would vote on a resolution calling for a moratorium, but said a decision about the death penalty in the U.S. is best left to the state and federal goverments. Recently, many U.S. states have been examining their use of lethal injection, and on Tuesday the U.S. Supreme Court agreed to hear a challenge from two Kentucky death row inmates who claim lethal injection amounts to cruel and unusual punishment. The court also halted Thursday the execution of a Texas man convicted of killing his parents. "There is a situation now where civilized societies, the world of culture, of law, is questioning this topic of the death penalty," D'Alema said. On Tuesday, Premier Romano Prodi called for the moratorium in his address to world leaders at the U.N. General Assembly, saying it would guarantee greater justice around the globe and an end to cultures of vengeance. 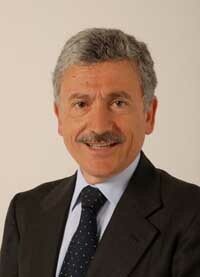 D'Alema said Italy aims to have a vote in December. "Our objective, which was approved by the European Union ... is to come to a vote during this 62nd General Assembly of the United Nations," he said.